Have a look at this Ganesh elephant, at first glance I thought "peculiar little elephant, but it's a cute pendant". Then I read the discription, and what is it *drum roll* a clutch. 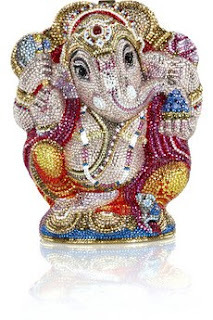 "Judith Leiber's hand-painted multicolored Ganesh clutch is a truly show-stopping heirloom accessory. Encrusted with hand-placed fine crystals and lined in gold leather, this decadent deity is an indulgent finish to every evening look"